When we gave up plastic, it was a massive relief that we could still buy chocolate. 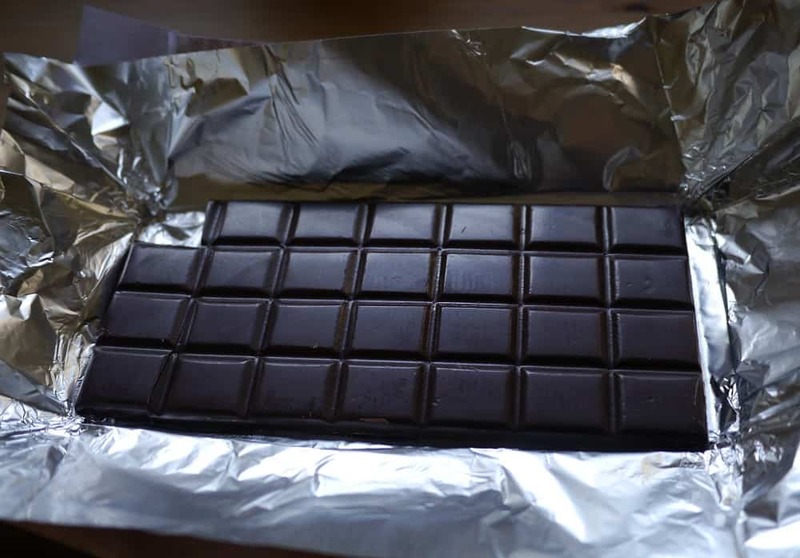 Plastic-free bars of chocolate wrapped in foil and paper were our salvation. I’ve tried making my own, messing around with cocoa butter and cacao powder but I just can’t make something that I like anywhere near as much as the stuff I can buy. Once we started down the plastic-free path I became a lot more aware of the additives, preservatives and other nasties in food, and slowly made the switch to the whole foods approach to eating. I now make most things from scratch, but I can’t make everything, and I want the things that I do buy to be as healthy as possible. For this reason I’m making the switch from milk to dark chocolate, and we stopped buying any chocolate made by Cadbury’s at the start of the year – have you looked at the ingredients list on those bars?! Now we’ve made a commitment to go one step further. I firmly believe that every time we spend our money we are voting – for the kind of businesses we want to support and for the kind of products we see on the shelves – and these choices define our futures. So we’ve made a commitment to only buy chocolate that is organic and fair trade. This seems like an obvious choice. But here in Australia, the confectionery aisle is dominated by Cadburys and Lindt, both of which are massive global companies. In the UK, it is much easier to support smaller ethical chocolate brands as they are more readily available. The bigger stores seem to offer so much choice, although it is often only a small handful of different brands, and the choice is actually between which additives (cunningly disguised as flavours) we prefer. Faced with so much “choice” it is easier to opt for whatever brand is on special offer. This is where the big companies (who can afford to sponsor promotions) win and the small guys lose out. We do it without even thinking. Well, now we’ve started thinking. We want to support fair trade because it pays a fair price to farmers, and supports ethical and sustainable practices. Child slave labour, exploitation and trafficking are issues linked to the cocoa industry, and supporting fair trade is one way to protest this. The international fair trade logo is something to look out for, but it is worth remembering that suppliers have to pay to receive certification, and smaller companies may not be affiliated due to the costs involved whilst still having fair trade policies – and if they do, they’ll be telling you on their packaging or website! Supporting organic is one way to avoid additives and preservatives, which are not allowed in organic produce, whilst also supporting sustainable agricultural practices. It’s still worth checking the ingredients list to make sure the cocoa content is high, sugar content is low and there are no cheap fillers like oil that offer no nutritional benefits. Not all producers can afford certification, so for very small companies do your research and use your judgement. Yes, organic and fairtrade chocolate costs more. Seriously though, how much are we talking? A 100g bar of Lindt costs $2.49 on special offer. Organic fairtrade chocolate may cost you $5. (For readers outside Australia, yes, the prices here are much higher than everywhere else!) Whilst that may be 100% more, in actual money we’re talking a couple of dollars. That extra couple of dollars is ensuring the farmer gets a fair wage. How much chocolate are you eating, anyways? Shouldn’t it be a treat, not a staple?! Green and Blacks was my favourite brand in the UK. Their Maya Gold bar was the first product in the UK to be labelled fairtrade, back in 1994, and I remember buying their chocolate when it was only available in health food stores. They actually sold out to Cadbury in 2005, however the original owner remains President and it still runs as a stand-alone business. Cadbury has since been sold to Kraft…so whilst it still has great eco credentials, it now lines the coffers of a multinational company. Alter Eco is a company I only found out about a few months ago, although according to their website they’ve been around for a decade. Their headquarters are in the US. They seem committed to fairtrade and sustainability, but I don’t know much about them. 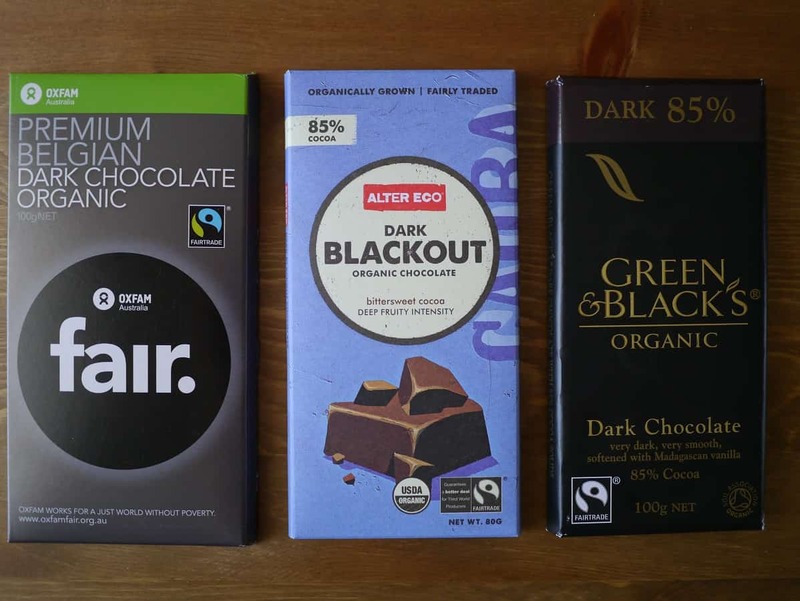 As for Oxfam, being a global not-for-profit organisation committed to poverty reduction, social equality and fair trade, they probably have the best credentials of all… except their chocolate is nowhere near as nice. Of course, it would be much more sustainable to not buy chocolate at all, seeing as it all comes from across the oceans. I’m not ready for that yet. Small steps, eh? Take one thing you do that’s not sustainable, and make it a bit more sustainable. And then move on to the next thing. And just keep going. I’m a fan of Green and Blacks, will have to try these other ones. Organic, and ethical is the only way to go! I generally get Green and Black dark chocolate if I get chocolate. Because I’m currently mainly house bound we’ve recently signed up with Aussie Farmers Direct for our organic fruit and vegetables. They come in a cardboard box with minimal plastic containers. I’ve seen Aussie Farmers Direct but I didn’t realise that their products are organic. Are they all organic or do they sell conventional produce too? I will have to do some investigating… I do like the Organic Collective (who deliver our box) but it’s good to know what alternatives there are. Aussie Farmers gives you the choice of conventional or organic. Ah, thanks for letting me know! I’ve always looked over them in the past because I thought they weren’t organic. Oh dear. And then there’s coffee. Oh yes. I had forgotten about that. And tea. Maybe something interesting for you: a bit like a decade ago this Dutch journalist found out about slavery in chocolate. He was shocked and felt responsible as this was most likely the heritage of te European and Dutch colonial history. He took action, and eventually he created his own fair trade chocolate brand. On this patch of the world he is responsible for making fair trade chocolate a mainstream thing. I love stories like this. Thanks so much for sharing Else! This journalist now has a team running this company. He’s taking it on to another unfair business: the clothing industry. I watched the documentary, and that made me change the way I buy clothes. Period. I also love seeing when one action leads to another. I am having a similar journey myself with Fair Trade, sustainable (and plastic-free) fashion. This path never stops unfolding before us!